Graduates of Trade High who received awards at commencement exercises this morning were from left Frederick J. Dupuis, Wayne L. Cheever, Lester M. Melanson, Rodney J. Dore, Thomas K. Beyea, Steven Derocher and William J. Wood. One of the glorious chapters in Lynn’s educational history came to a close this morning as diplomas were awarded to 79 graduates of Trade High during exercises at the Harrington School auditorium. Thus was the last class to graduate from the school as it is presently known. In September, classes will be held in the new Lynn Vocational and Technical Institute now being built in the Lynnway-Summer urban renewal area. Robert F. Spousta, manager of apprentice training at the General Electric Co. River Works was the commencement speaker. He added that the graduates would succeed in their chosen trades if they became aware of the importance of productivity, selected a job with a future and adopted a policy of stick-to-itiveness. Diplomas were presented to the graduates by School Committeewoman Shirley A. Phelan. Awards donated by Greater Lynn businesses and organizations were presented to winning students. The class precession was led by Lester M. Melanson, class president who also delivered a brief address on the importance vocational education. A musical program was provided by the Trade High chorus under the direction of Ruth L. Curtis, supervisor of vocal music in Lynn schools. Basic Electronics: Robert J. Dore, Dennis M. Faino, James E. Fe?d, William J. Lomasney, Carmen Luongo III, Stanley J. Odachowski, John A. Perry, James R. Peterson, and Gary A. Spillane. Cabinet Making: George E. Bansfield, Thomas H. Churches, Eugene L. Ford, Harold W. Grant, and Jerome E. Mrockowski. Drafting: Gary E. Baker, Steven B. DeRocher, Edward A. Morrill, Robert H. Svenson, Jr., Steven M. Terenzi, William J. Wood, and Richard F. Zukowski. Electrical: Joseph A. Boudreau, Thomas J. Carbone, Eric F. S. Chisholm, Jeffrey E. Cohen, Paul F. Doane, Paul H. Jenkins, Warren S. Kench, Robert E. Lee, Lester M. Melanson, James A. Ottani, Jr., Michael L. Sampsom, Steven W. Verrell, Steven J. Waitt, Donald L. Woodbury. Graphic Arts: Peter G. Abernathy, John R. Benham, Jr., Eric Bursey, Thomas A. Downing, Steven J. Renda, and David F. Sullivan. Machine Shop: Douglas A. Adgurson, Paul R. Barron, Gary S. Beaton, Thomas K Beyea, Jeffery L. Byrd, James P. Caswell, Ernest F. Chandler, Wayne L. Cheever, Jeffery Davidson, Jr., Lawrence J. DeMarco, Paul R. Desrochers, and Eugene J. LeBlanc, Martin D. Neylon, Kevin P. Ordway, William F. O’Shea, Kenneth B. 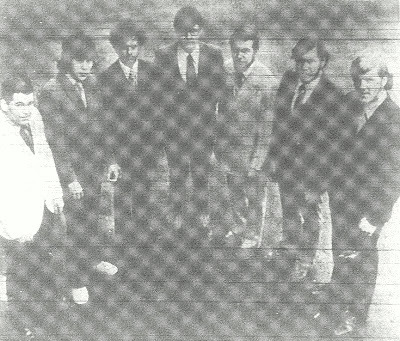 Page, James R. Perry, Thomas R. Philbrook, Michael D. Ryan, Robert J. Scanlon, Steven A. Turgeon, John M. Walsh, George A. Zaborowski, and Thomas J. Zabrowski. Shop Carpentry: Christopher J. Christ, Frederick J. Dupuis, Joseph F. Gordinas, Alfred B. McKanas, Jr., Wayne S. Spates, Richard O. Sprague, and Kenneth H. Volovick. Sheet Metal: Leonard DiFlippo, James M. Fulcher, Thomas J. Greco, Donald G. Hunt, James G. Mamos, Brian E. Mills, Joseph M. Savio. Awards for academic proficiency have been presented to seven members of the graduating class of Trade High. The presentations were made this morning during the graduation exercises at the Harrington School. Frederick J. Dupuis, son of Mr. and Mrs. Joseph Dupuis, 2 Murray St. was the recipient of the Lynn Teachers Association Award. Dupuis is a graduate of the shop carpentry course. The Lynn Teachers Union Award was presented to Wayne L. Cheever, son of Mr. and Mrs. Earl Cheever, 80 Johnson St. Cheever is a graduate of the machine shop course. Lester M. Melanson, the class president was the winner of the General Electric Managers Award. The son of Mr. and Mrs. Lester N. Melanson, 433 Western Ave., he is a graduate of the electrical course. The award was presented by Vincent H. McManus, manager of community operation of GE. Rodney J. Dore, son of Mr. and Mrs. William J. Dore, 44 Hayes St., received the award donated by the Fairview Machine Co. of Lynn. The award was presented by Thomas O. Moulton, president of the firm. Dore is a graduate of the basic electronics course. An award sponsored by the Seaside Steppers Square Dance Club of Lynn was presented to Thomas K. Beyea, son of Mr. and Mrs. William K. Beyea, 25 Great Woods Road. Beyea is a graduate of the machine shop course. Recipients of awards for outstanding achievement in mechanical drafting were Steven Derocher, son of Mr. and Mrs. Ronald Derocher, 97 Henry Ave., and William Wood, son of Mr. and Mrs. John Wood, 18 Cameron Road. The awards were presented by Thomas Nicholson, president of Local 142, American Federation of Technical Engineers, sponsor of the awards.